Have you noticed that you have more trouble than you used to when trying to open a jar? Is your grip weaker than it used to be? Or would you just like your grip to be stronger? If you answered yes to any of those questions I have to tell you about something you need to try. Hand Gripper Set by Shadibody is really great for strengthening your grip, I can even feel it in my wrists when I use it. This Hand Gripper is adjustable according to the strength you have, you can make it as easy or difficult to squeeze according to the level of resistance you desire. It has ergonomically designed foam covered handles for a slip proof grip and a comfortable grip. It comes with wrist wraps that fit all hands and has a terry cloth thumb loop to hold them in place. They offer great support and protection from injury to your wrists. 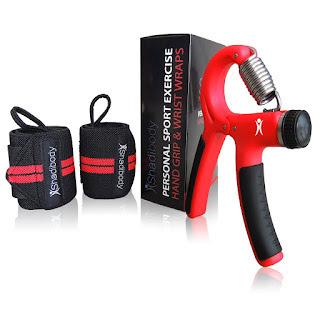 This is great for weight lifters, golf players, rock climbers, tennis players, and musicians like drummers guitar players, violinists, and pianists. Also helps with tendinitis, arthritis, carpal tunnel syndrome and other hand injuries. Both the hand gripper and wrist wraps are small and very portable, making it easy to carry with wherever you go. There is a worry free 1 year guarantee that's better than just a money back guarantee. If there is any issue with your hand gripper your money will be refunded plus you will be sent a replacement as well.